It needs a new battery and some more TLC, but I look forward to working on it. I am considering to ' upgrade' to a DX/2 66MHz, but that would violate the authenticity of the machine a bit. A Compaq branded VGA monitor and keyboard for it would also be nice so I will be on the lookout for those as well. Eek! A trident! Get it away! That is a Compaq Q-vision! Scraphoarder wrote: The odd AGP form factor were annoying and beside the ATI cards i never saw other that used that except a Matrox card. Beside the ATI shown above and the Matrox mentioned there was the ELSA Synergy II and the Storm pro availiable with this weird bracket. Compaq used it on different machines, like the Deskpro 2000/4000 the AP500, the above mentioned DP6266 and probably more. 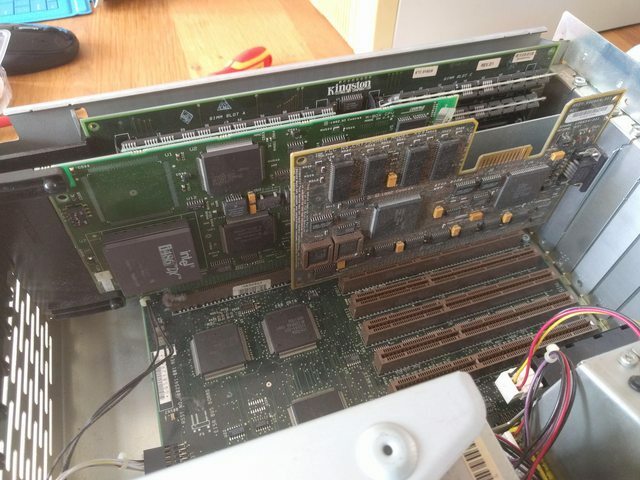 Reason must have been that it wasn´t possible to move the AGP to the riser board like ISA and PCI and the lower portion of the slot was blocked by the motherboard drawer Compaq used. Looking for replacement for the ATI in my AP500 I even spotted IBM branded Matrox cards with the same bracket. Not sure what system they originated, or if the were converted later, but having an IBM FRU number they seem to be originating from IBM systems. Scraphoarder wrote: I got this Deskpro XL 575 today and it seems to have survived a trip over Atlantic by ship. I have been looking for a XL like this for a long time and its a substitute for i didnt save one of two XL 6200 and five XL 5100 years back. The XL 6200 was my first pc at my current work then i started there in 1999. The cool thing with this model is all the CPU cards you can throw in them ranging from Pentium 60 to Pentium Pro 200 that i had at work. I think maybe a 486 card also will fit since its in the Compaq Flex system. Nice system you got there, but was there really none to find on this side of the pond? I´m pretty sure 486er boards existed, must have a look back home. The Prosignia 200/500 use the same CPU boards. I own some of these systems myself, even one 6180 upgraded to 6200 serving as my office computer for several years. Do you have one of these Vocalyst keyboards for it, using this proprietary connector including audio in and out? I own several, but there all german layout (http://www.freestuffandmoney.com/forsal ... 783001.htm). Tweaked most of my CPU boards to run at 120 Mhz by changing some of the SMD resistors on the CPU board, but never managed to get one running at 33 Mhz base clock. Unluckily there are no DIP switches for the CPU clock. Apologies for resurrecting this old-ish thread but it made more sense to do so then to start a new thread on such a related matter. I have obtained one of these charming SFF Deskpro EN models, although mine has a terribly yellowed bezel and a 24x Creative CD-ROM replacement that need a good deal of retrobrighting.. I have three questions regarding this system, as I never owned a Compaq before. 1. This board seems to be an i815 B0 stepping, so I'm assuming I can use it with Tualatin P3 and P3-S CPUs? 2. My understanding is that this requires a BIOS update, but I'm completely lost on how the BIOS thing works for Compaqs.. Apparently they are on the hard drive? Do I need to download the latest ROMPAQ and it's one and done? 3. Coincidentally, I want to replace the 20GB Hard drive in the machine with a higher capacity drive; does this mean I need to do some special BIOS install onto the drive first? How do I go about this? Is there a reasource that explains the matter nicely? appiah4 wrote: 1. This board seems to be an i815 B0 stepping, so I'm assuming I can use it with Tualatin P3 and P3-S CPUs? Think i read on the FB Retro Machines group that they took Tualatins. appiah4 wrote: 2. My understanding is that this requires a BIOS update, but I'm completely lost on how the BIOS thing works for Compaqs.. Apparently they are on the hard drive? Do I need to download the latest ROMPAQ and it's one and done? appiah4 wrote: 3. Coincidentally, I want to replace the 20GB Hard drive in the machine with a higher capacity drive; does this mean I need to do some special BIOS install onto the drive first? How do I go about this? Is there a reasource that explains the matter nicely? We still use a Deskpro EN SFF at work for Dban old IDE drives and last week i wiped some 200 and 300GB drives. They got detected as a 120GB or something like that in the Bios, but Dban saw the entire drive size. Fantastic, thank you.. One last question; the cpu cooler on this thing is driving me nuts. I can not, for the life of me, find a way to remove it. What is the sorcery that actually unlatches it from the pegs? The green thing is supposed to be pressed down I believe, but the hook does not budge at all? Last edited by appiah4 on 2018-9-04 @ 04:38, edited 1 time in total. In old Compaqs and many other vendors as AST, IBM and NCR, the BIOS firmware core still lives in ROM, as any other computer firmware you know. But them don't have a built-in-rom CMOS/NVRAM setup utility. So, to setup CMOS/NVRAM values you need an extra utility living on a bootable diskette or special firmware partition. Why them didn't had a built-in-rom setup utility? Because the setup utilities from these vendors were generally more complex than the ones used by AMI, AWARD, Microid, ACER/SystemSoft or Phoenix, including graphical utilities, special logic configuration stuff or testing/asset tools. Also the firmware core of these machines was complex, bigger, and generally it had many uncompressed modules, so there was just enough space for it in the rom chip. appiah4 wrote: Fantastic, thank you.. One last question; the cpu cooler on this thing is driving me nuts. I can not, for the life of me, find a way to remove it. What is the sorcery that actually unlatches it from the pegs? The green thing is supposed to be pressed down I believe, but the hook does not budge at all? Im think it should be pressed down and pushed in one angle so the clamp release it from the CPU socket. I have tried this and the clip is so strange that pressing it down does not seem to detach the clamp from the peg; My theory is that it needs to slide off the peg somehow? I've checked teardown videos online but other EN SFFs seem to have a more regular and smaller cooler, I suppose the one on mine is the Tualatin cooler (as the board is a Tualatin capable revision?) I have no idea.. It's driving me crazy! ^Yes, you have to remove the fan first then the green lever can be pulled up to loosen the grip on the pegs and then you can angle it free from the socket. Nice machine, great nickname (and picture), Commander! Got too much tachyon poisoning in your hair? Bring it down to 75% please. PC Hoarder Patrol wrote: ^Yes, you have to remove the fan first then the green lever can be pulled up to loosen the grip on the pegs and then you can angle it free from the socket. It's not the most convenient design for (un)installing it, but it does seem solid! It should handle a Tualatin just fine, but that also depends on the airflow in the case and the fans speed/air displacement. I'm having issues with the onboard IDE controller of a Deskpro EN, so I added a PCI ATAPI control card to the system. However, the BIOS seems to have absolutely no option to boot from IDE devices that are on other controllers - they do not show up on the Boot Priority BIOS option.. Am I missing something?